Kids don’t learn how to pray at church. They certainly won’t learn how by reading about it. Instead, they will learn by listening to Mom and Dad pray. Praying with your kids is one of the most important things you can do as a parent to pass down your faith to the next generation. Pray with them every single day. We learn quicker when we practice daily. I’ve taken several language classes – Spanish, Greek, Hebrew – and daily practice is the key to keeping up with vocabulary and fluency. If I skipped a few days of rehearsing, I forgot what had taken weeks to memorize. 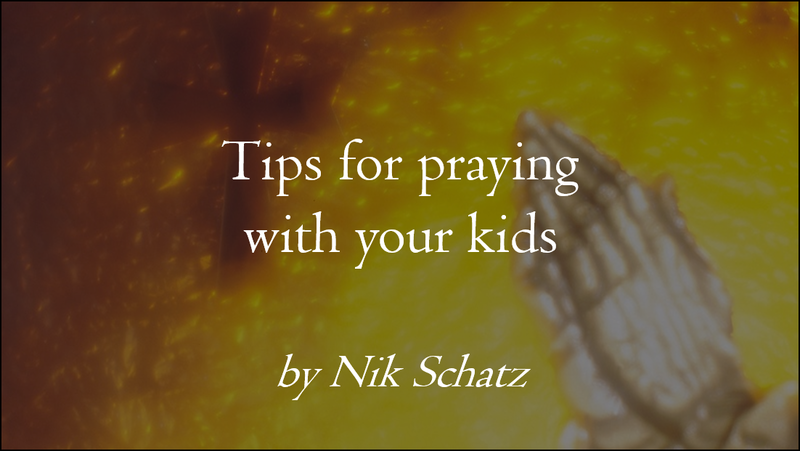 In the same way, if you pray every day with your kids, they will start picking up on the vocabulary and structure of your prayer. They’ll learn how to address God, what kinds of things you talk to God about, the kind of attitude you are supposed to have when praying, the reverence of talking to God, etc. Every child, no matter what age, deserves to know that Mom and Dad pray for them. I want my kids going to bed thinking “My dad just talked to God about me”. I want them at school thinking “God is watching over me, because I heard my dad ask God to do that.” I want them to know that “God cares about my headache, because my dad just asked God to help me feel better.” Never allow your kids the chance to wonder if prayer is important, or wonder if their parents pray for them – pray FOR them while you are WITH them every day. If your goal is to pray every day, then realistically you’ll pray every other day, or maybe two out of every three days. We get preoccupied, we get busy, we get tired – so stuff gets pushed off. That’s life. If prayer is a weekly routine, you may only pray once or twice a month with your kids. But if it is a daily habit, you’ll likely end up praying with them four or more days a week. That’s a good spiritual legacy to leave them. Remember: Pray FOR your kids, WITH your kids. They need to hear you do it!